What is a teaching dossier not? What is in a teaching dossier? How should a dossier be organized? How do I present evaluations of teaching? What is solicited vs. unsolicited feedback? What qualifies as an appendix? A teaching dossier is a combination of documents-narrative descriptions of teaching, sample teaching materials and teaching evaluations-that highlights and summarizes the educator’s teaching experience. A strong dossier is concise and selective. It is also authentic, sincere, well-written and well-organized. An effective teaching dossier should provide a snapshot of you as a teacher that allows a reader to identify your own approach to teaching and how you value student learning. provides an accurate portrait of you in the classroom (in other words, the person portrayed through your dossier should be the same person who is asked to teach a class or give a job talk as part of a job interview). A teaching dossier is not an exhaustive account of all the teaching you’ve ever done, nor is it a collection of all the teaching materials you’ve ever used. Neither is a teaching dossier a repetition of what’s already in your c.v. CAUTION: A teaching dossier is also typically not an opportunity to showcase all you might have learned about pedagogical theory. Use jargon sparingly, or avoid it altogether. Quote secondary sources only if they truly support the illustration of your teaching strengths. consider your teaching goals – what do you want to be able to teach students? consider your learning goals – what do you expect students to learn from you? PLEASE SEE APPENDIX #1: How to define effective teaching. write about innovations: did you try something new in class? did you take a risk? what happened? write about your best teaching experience: what do you think your students learned? what exactly did you learn? write about your worst teaching experience: what didn’t work? what would you do differently next time? write about measures taken in response to feedback on teaching: have you incorporated feedback into your teaching? what did you change? 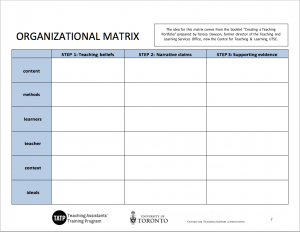 The order in which you present your materials can vary, although most people start with either the STP or their list of teaching responsibilities. When describing your teaching experience, start with your most recent work experience at the postsecondary level-when you had the greatest level of responsibility-and work your way back from there. teaching philosophy: “This is what I believe is important about teaching and learning…”. teaching experience: “This is what I can do…”. teaching goals: “This is what I want to do in the future …”. evidence of professional development and growth as a teacher: “This is how I’m improving what I do now…”. PLEASE SEE APPENDIX #2a: Suggested outline for a teaching assistant preparing their first dossier. PLEASE SEE APPENDIX #2b: Suggested outlines for a faculty member preparing a tenure application. See below for an example of contents of a teaching dossier. *These three points can be grouped together in one narrative description (in one STP), or separated out as they are here. The three categories together or the one STP should not exceed two pages in length. PLEASE SEE APPENDIX #3: Materials on how to develop an effective STP. 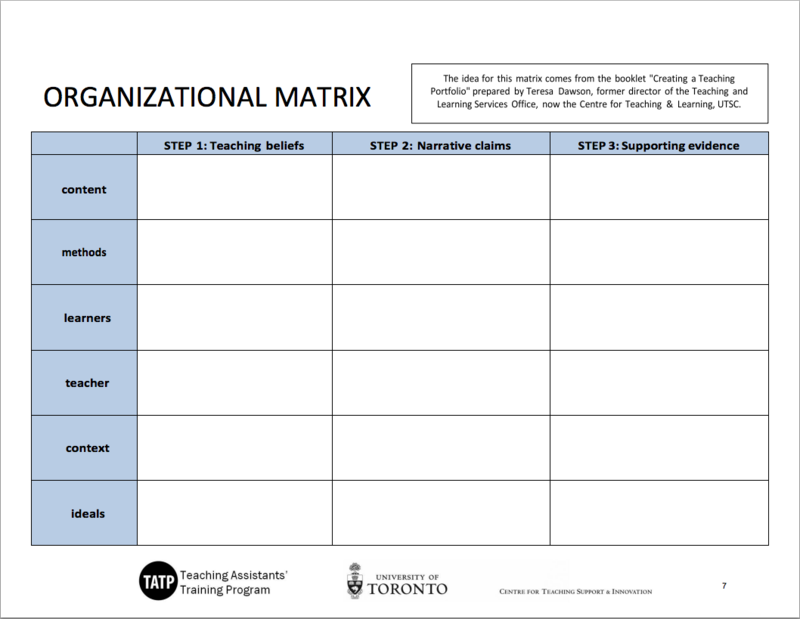 The idea for this matrix comes from the booklet “Creating a Teaching Portfolio” prepared by Teresa Dawson, formers director of the Teaching and Learning Services Office, now the Centre for Teaching & Learning, UTSC. PLEASE SEE APPENDIX #4: Examples of tabulating your teaching experience. What did you like best about your learning environment as an undergraduate? What conditions were necessary in order for you to do your best work? Contrast your experience as an undergraduate with your current experience as a graduate student. What is different? What works better for you as a graduate learner? Who inspired you to pursue graduate studies? Why? Did you encounter models of good teaching in your past experience as a university student? Explain their teaching styles. Relate how they taught to how you learned in their classes. 1. Ask to observe a professor’s lecture. 2. Ask to observe a senior TA’s class or lab demonstration. 3. Seek out opportunities to mentor fellow graduate or undergraduate students. 4. Seek out opportunities to tutor secondary or undergraduate students. 5. Volunteer to teach writing or math skills. What did you learn about teaching (and learning) from the above experiences? Based on these experiences, what can you say are your goals for your first contact with university students in the classroom? From this, devise a “plan of action” for your first university class. Design a sample quiz or activity or experiment that you would like to use when you start teaching. Design a sample course outline. Compile a sample reading list for a proposed course, etc. Conduct research on innovative educational technologies (e.g., i-clickers). 2. Participation in conferences, or individual sessions at conferences, related to teaching and learning at the postsecondary level. Participation in departmental committees that focus on undergraduate programs (e.g. curriculum development and planning). 4. Delivering workshops for your fellow TAs on teaching and learning. 5. Reviewing a book or article related to teaching in your field. 6. Joining a listserv or an association related to teaching in your field. How do I present evaluations? What is solicited versus unsolicited feedback? When a student or a professor sends you an email or a note thanking you for your contribution to the course or for your hard work and availability during the term-and you did not explicitly ask for this recognition-this is unsolicited feedback on your teaching. Unsolicited feedback can be more valuable than solicited feedback, in that it offers spontaneous and unmotivated recognition. Solicited feedback involves seeking out a course supervisor for a course you’ve TA’d, or a student who has done well in your course (after the course is over and final grades have been approved), and asking them to write you a note about your work as their TA. The appendices contain the teaching documents, or artifacts, that support your narrative claims in the rest of your dossier. This section of your dossier should contain the evidence to illustrate your teaching effectiveness. NOTE: The documents you include in your appendices should match the teaching claims in your Statement of Teaching Philosophy. For each major claim, include only one or two documents to support it. Try to limit your supporting documents in this way. The above publications include samples of real teaching dossiers from faculty members at various stages of their careers. They are available for on-site consultation from the University ofToronto’s Centre for Teaching Support & Innovation, 4th floor, Robarts Library, 130 St. George St. APPENDIX #2a: Table of Contents from a University of Toronto TA’s dossier. APPENDIX #2b: Various examples of Table of Contents. APPENDIX #3a: “Developing a Philosophy of Teaching Statement”, article by Nancy Van Note Chism. APPENDIX #3b: “An Eloquent, Insightful Teaching Philosophy Statement”, by Barbara Licklider. Excerpted from The Teaching Professor. APPENDIX #3c: “Philosophy of Teaching” statement by Laura M. Luehrmann, The Ohio State University. APPENDIX #4: Sample chart of list teaching experience: as a course instructor and as a Teaching Assistant. Taken from the Teaching Dossier of William M. Flanik. APPENDIX #5a: Sample form used to summarize numerical results of student evaluations for multiple courses taught by William M. Flanik. APPENDIX #5b: Sample of summary of course evaluations for one course taught across several years. The examples also includes student comments from one annual evaluation. Taken from the Teaching Dossier of Michal Kasprzak. Christopher Knapper and Susan Wilcox, Preparing a Teaching Dossier, Centre for Teaching and Learning, Queen’s University, 2007 (revised). Through discussion, consultation and reading, the sub-committee (on teaching performance) has developed the following statement on effective teaching and learning. This statement is not intended to be exhaustive. Rather, it intends to signal some general criteria on what constitutes effective teaching and learning in the Queen’s context. The sub-committee takes a broad view of what constitutes teaching. Teaching includes not just in-class interaction between students and professors, but also, for example, such things as academic advising and graduate supervision. (1) Effective teaching is a scholarly activity which is integral to the duties of all faculty members at Queen’s University, and to which they are expected to devote substantial proportions of their professional time. Effective teachers place high value on the teaching enterprise and the subject taught, manifest knowledge, interest and enthusiasm, and provide appropriate intellectual challenges to students. By inspiring and encouraging students, effective teachers draw students into the world of the disciplines, the university, and the habit for inquiry that guides the life-long search for understanding. (4) Effective teachers recognize and engage with the diversity of student experience and intellectual perspectives. Teaching is a highly complex interplay of relationships between teachers and students within which an effective teacher reveals and encourages respect for differences amongst students and seeks to draw on that diversity in a way that builds a constructive experience of learning for all. Effective teachers are therefore committed to the equitable treatment of all students and to understanding and removing barriers to learning that may have impeded the academic progress of those who are non-traditional students. (5) Effective teachers promote both independent and collaborative learning on the part of students by fostering the talents, skills, abilities, and most important, the desire of students to take responsibility for continued learning. (6) Effective teachers are reflective, self-critical and flexible. They consistently seek to learn from their students, from their own teaching, and from the teaching of others, and, in response, are willing to modify their instructional approaches. The committed teacher also serves as a role model and mentor to colleagues. What is effective teaching may vary with particular disciplines as teachers seek to address a wide variety of students, and approach diverse topics in diverse ways at different levels of expertise. Effective teaching and learning occur through intensive interaction of teachers and students in a variety of places, both inside and outside the classroom, and as changing technologies offer new opportunities for expanding and diversifying the contexts of learning. Table of contents from a teaching dossier of a Teaching Assistant at the University of Toronto in Political Science. Example 1: The “Teaching Dossier: A Guide” prepared by University Teaching Services at the University of Alberta proposes the following format. Example 2: Peter Seldin (1997) in his book “The Teaching Portfolio” recommends the following format (one of many in his book). Example 3: “Recording Teaching Accomplishment” produced by Dalhousie University offers this example (one of many). Example 4: Yet another format might incorporate the following elements. When asked to write a statement on their philosophy of teaching, many college teachers react in the same way as professionals, athletes, or artists might if asked to articulate their goals and how to achieve them: “Why should I spend time writing this down? Why can’t I just do it?” For action-oriented individuals, the request to write down one’s philosophy is not only mildly irritating, but causes some anxiety about where to begin. Just what is meant by a philosophy of teaching statement anyway? Besides fulfilling requirements, statements of teaching philosophy can be used to stimulate reflection on teaching. The act of taking time to consider one’s goals, actions, and vision provides an opportunity for development that can be personally and professionally enriching. Reviewing and revising former statements of teaching philosophy can help teachers to reflect on their growth and renew their dedication to the goals and values that they hold. Narrative, first-person approaches are generally appropriate. In some fields, a more creative approach, such as a poem, might be appropriate and valued; but in most, a straightforward, well-organized statement is preferred. The statement should be reflective and personal. What brings a teaching philosophy to life is the extent to which it creates a vivid portrait of a person who is intentional about teaching practices and committed to career. Conceptualization of learning. Interestingly, most college teachers agree that one of their main functions is to facilitate student learning; yet most draw a blank when asked how learning occurs. This is likely due to the fact that their ideas about this are intuitive and based on experiential learning, rather than on a consciously articulated theory. Most have not studied the literature on college student learning and development nor learned a vocabulary to describe their thinking. The task of articulating a conceptualization of learning is therefore difficult. Many college teachers have approached the work of describing how they think student learning occurs through the use of metaphor. Drawing comparisons with known entities can stimulate thinking, whether or not the metaphor is actually used in the statement. For example, when asked to provide a metaphor, one teacher described student learning in terms of an amoeba. He detailed how the organism relates to its environment in terms of permeable membranes, movement, and the richness of the environment, translating these into the teaching-learning context by drawing comparisons with how students reach out and acquire knowledge and how teachers can provide a rich environment. Grasha (1996) has done extensive exploration of the metaphors that college students and teachers use to describe teaching and learning. An earlier classic that also contains an exploration of metaphors of teaching and learning is Israel Scheffler’s The Language of Education (1960). Reinsmith (1994) applies the idea of archetypes to teaching. Such works might be consulted for ideas. A more direct approach is for teachers to describe what they think occurs during a learning episode, based on their observation and experience or based on current literature on teaching and learning. Some useful sources that summarize current notions of learning in a very accessible way are contained in Svinicki ( 1991), Weinstein & Meyer (1991), and Bruning (1994). Teachers can also summarize what they have observed in their own practice about the different learning styles that students display, the different tempos they exhibit, the way they react to failure, and the like. Such descriptions can display the richness of experience and the teacher’s sensitivity to student learning. Conceptualization of teaching. Ideas on how teachers can facilitate the learning process follow from the model of student learning that has been described. If metaphors have been used, the teacher role can be an extension of the metaphor. For example, if student learning has been described as the information processing done by a computer, is the teacher the computer technician, the software, the database? If more direct descriptions of student learning have been articulated, what is the role of the teacher with respect to motivation? To content? To feedback and assessment? To challenge and support? How can the teacher respond to different learning styles, help students who are frustrated, accommodate different abilities? Goals for students. Describing the teacher role entails detailing how the teacher can help students learn, not only a given body of content, but also process skills, such as critical thinking, writing, and problem solving. It also includes one’s thoughts on lifelong learning — how teachers can help students to value and nurture their intellectual curiosity, live ethical lives, and have productive careers. For most teachers, it is easier to begin with content goals, such as wanting students to understand certain aerodynamic design principles or the treatment of hypertension. The related process goals, such as engineering problem solving or medical diagnostic skills, might be described next. Finally, career and lifelong goals, such as team work, ethics, and social commitment, can be detailed. Implementation of the philosophy. An extremely important part of a philosophy of teaching statement is the description of how one’s concepts about teaching and learning and goals for students are translated into action. For most readers, this part of the statement is the most revealing and the most memorable. It is also generally more pleasurable and less challenging to write. Here, college teachers describe how they conduct classes, mentor students, develop instructional resources, or grade performance. They provide details on what instructional strategies they use on a day-to-day basis. It is in this section that teachers can display their creativity, enthusiasm, and wisdom. They can describe how their No Fault Test System or videotaping technique for promoting group leadership skills implements their notions of how teachers can facilitate learning. They can portray what they want a student to experience in the classes they teach, the labs they oversee, the independent projects they supervise. They can describe their own energy level, the qualities they try to exhibit as a model and coach, the climate they try to establish in the settings in which they teach. Personal growth plan. For some purposes, including a section on one’s personal growth as a teacher is also important in a statement of teaching philosophy. This reflective component can illustrate how one has grown in teaching over the years, what challenges exist at the present, and what long-term goals are projected. In writing this section, it helps to think about how one’s concepts as well as actions have changed over time. It might be stimulating to look at old syllabi or instructional resources one has created, asking about implicit assumptions behind these products. Dialogue with colleagues, comparison of practices with goals, and examination of student or peer feedback on teaching might help with the task of enumerating present questions, puzzles, and challenges. From these, a vision of the teacher one wants to become will emerge. Describing that teacher can be a very effective way to conclude a philosophy of teaching statement. By far, the best philosophy of teaching statement examples for most college teachers are those of peers who teach in similar settings or disciplines. Since statements tend to be tailored to specific contexts, peer examples are thus highly appropriate models. Dialogue with colleagues on these statements can help to stimulate ideas for one’s own statement as well. Other examples are contained in several recent books on teaching portfolios, such as Seldin (1993) and O’Neil & Wright (1993). Reflective books on effective college teaching often contain extensive descriptions of teaching philosophies, such as the chapter on “Developing a Personal Vision of Teaching” in Brookfield’s The Skillful Teacher (1990) and “Three Teaching Principles” in Louis Schmier’s Random Thoughts (1995). Grasha, A. (1996). Teaching with style. Pittsburgh: Alliance Publishers. O’Neil, C., & Wright, A. (1993). Recording teaching accomplishment. (4th ed). Halifax, Nova Scotia: Dalhousie University. “An Eloquent, Insightful Teaching Philosophy Statement”, by Barbara Licklider. Excerpted from The Teaching Professor. Ed.’s note: From time to time we publish teaching philosophy statements. Some not only articulately capture beliefs about teaching, they do so eloquently and with an uncommon level of insight. Here’s an example from Barbara Licklider, who teaches education and leadership courses. I believe a good teacher, first, has a powerful faith in the future. Like the forester planting an oak seedling knowing he or she will never see the tree in all its glory, I know I may never see the fruits of my labors as teacher. My calling is to plant and nurture seeds that will grow and shape tomorrow. The good teacher knows and understands students, how they develop and learn. I know that students actively construct and transform their own knowledge based on past experiences and prior learning. I know that students do not all learn in the same way or at the same rate. I believe it is my responsibility as a teacher to be an effective diagnostician of students’ interests, abilities, and prior knowledge. I must then plan learning experiences that will both challenge and allow every student to think and grow. I believe a good teacher must also understand motivation and the effects of peer interactions on learning. I want all my students to achieve at high levels, so I avoid sorting them and setting them up to compete with each other. I know most learning happens through social interaction; therefore, I structure learning so that students productively collaborate and cooperate with each other the vast majority of class time. The good teacher must know her subjects and how to help students learn those subjects. I know the good teacher must have a deep appreciation of how knowledge is created in the discipline, how it is organized and how it is linked to other disciplines. I use my knowledge of the discipline to expose my students to modes of critical thinking, encouraging them to analyze, apply, synthesize, and evaluate all they read and hear. I love the subjects I teach, and I know how to make them come alive for my students. A good teacher cannot begin or continue to inspire learning without being a learner. The good teacher must constantly learn what is new in the discipline. In fact, the good teacher often helps to create new knowledge. To live this belief, I must continuously examine my teaching methods and find new ones. To remain connected to my students, their lives and the schools in which they will practice their professions, I must be a student of society and the constantly changing worlds in which students live. I eagerly and willingly learn from my students as they learn with me. I believe a teacher is the most powerful of role models. I am ever aware of the awesome obligation I have to “walk my talk” with my students. If I ask them to live their values and beliefs, I must do the same. I expect the best — of myself and others — and, therefore, I usually get the best. I try to treat all people with dignity and respect, and I expect my students to do so also. Despite writing a teaching philosophy, I really prefer to think about learning and helping others learn as opposed to teaching. I believe many of us have come to accept a working definition that teaching means giving information, which I believe is only the beginning of teaching and certainly only a small part of learning. When one gives information, it is so easy to equate learning with the memorization of that information. Memorization is not always learning because learning requires thinking. I am beginning to understand that the teacher’s greatest gift to the learner is helping the learner be motivated to think, and then to want to learn more. I believe in the power of questions and questioning strategies to cause thinking. I constantly try to ask questions for which there are no “right” answers. I constantly work to become a better “questioner” for the effective use of questions is the most powerful strategy a teacher has to help students learn. Finally, I believe a teacher lives to serve. A teacher is dedicated to learning, to his or her discipline, to his or her students, and to making the future the best possible place for all of us to live. These are the challenges I accepted when I chose to be a teacher. I remain committed to them. I am a firm believer in active learning, and I try to maintain a very lively and interactive classroom. To me, teaching is not about lecturing to students; it is about presenting theories, concepts, and empirical material to students in a way that they can integrate this information into their own life experience. I try to accomplish this not only in my presentations and lectures, but in the questions that structure classroom discussion and, particularly, in writing assignments. For example, the culmination of my Political Ideologies class is a paper in which each student must sketch his or her own political ideology, as well as how this approach compares to two major contemporary ideologies of our world. I have similar writing assignments in my other courses as well. In each of my classes, I emphasize critical thinking and real-world applications of the concepts and issues we study. I try to engage students who sometimes fail to see the humanity of political and social situations in other countries, or, more commonly, who overlook the interconnectedness of world events with our life in the United States. For example, to teach about rural politics in China, I have constructed a role-play exercise in which the students assume the identity of rural agricultural workers, peasant entrepreneurs, and party cadres, in an attempt to portray the competing priorities and challenges of implementing policies in rapidly changing circumstances. I also begin each one of my classes with a discussion of current events which are related to our subject matter. I have found this exercise most useful in the Political Ideologies classes, when students sometimes view political “theory” as completely divorced from contemporary political “reality”. Finally, I do not see a rigid dividing line between research and teaching. Good teachers need to be at the cutting edge of recent scholarship, in order to help students see the dynamism of our work. Social science is not a collection of facts, but rather, an area of research that is still alive with puzzles, contradictions, and new areas of inquiry. I try to “demystify” research for students, by encouraging them to discover the excitement that can be found in researching the political world. I welcome the opportunity to supervise independent projects, and I have encouraged students in my own classes to submit their writing to appropriate journals for review. One of my students published his work in Wittenberg University’s East Asian Studies Journal, and two more have submitted their papers for review this year. In addition to the three courses I have taught at Ohio State (Introduction to Comparative Politics, Modern Political Ideologies, and Chinese Politics), I am also interested in teaching courses on Asian Politics and Foreign Policy, Democratic Transitions, Political Participation (especially in non-democratic regimes), Political Development, and State-Society Relations. Sample chart of teaching experience. Taken from the Teaching Dossier of William M.Flanik. This section outlines my past and present teaching responsibilities. For the past two years, I’ve been a Teacher Assistant (TA) Trainer at the Centre for Teaching Support & Innovation (CTSI) at the University of Toronto. In that role, I design and deliver introductory training to new TAs, create and facilitate in-depth workshops on various aspects of undergraduate instruction, and offer feedback on TAs’ teaching in simulated and actual classroom settings. CTSI is selective in the trainers it hires; applicants must demonstrate teaching excellence in both written applications and in live teaching demonstrations. I was chosen as a TA Trainer in part due to the breath and depth of my teaching experience. Over the past decade, I’ve taught and helped teach different courses in poltical science and in interdisciplinary programs. I’ve taught several of these courses multiple times. I served as a temporary instructor for on graduate course ad I have taught or helped teach undergraduate courses at several levels. My experience runs the gamut from general introductory classes (e.g., U.S. Government) to rigorous courses in selective programs like the Trudeau Centre for Peach and Conflict Studies. Over the years, I’ve worked at two universities and across all three campuses of the University of Toronto. The Greater Toronto Area is among the world’s most multicultural metropolitan regions, and the University of Toronto student body reflects that. I have taught students from a wide range of backgrounds, and my teaching leverages all forms of diversity to enhance student learning. The tables below summarize my academic teaching experience. The first table lists the courses for which I’ve served as a temporary instructor. The second table lists my TA positions. Quantitative summary of student evaluation acorss several courses. Taken from the teaching Dossier of William M. Flanik. This sub-section summarizes the key quantitative results from my student evaluations. The Following table lists all thirteen courses for which data are available. I’ve listed the courses in reverse chronological order. The right-hand side of the table gives my average score on question 10 of the University of Toronto, Department of Political Science evaluation form, which reads: “How would you rate the overall effectiveness of the TA?” In two cases, the Department did not collect data and I initiated my own anonymous evaluation, using the questions: “How would you rate Bill’s overall performance [as a temporary course instructor]?” In all cases, the scale runs from 1-5, where 1 = “poor” and 5 = “excellent.” As indicated at the bottom of the table, my mean effectiveness score from 2004-2012 is 4.3/5. Summary of teaching evaluations in one course across several years. Taken from the Teaching Dossier of Michal Kasprzak. Teaching Evaluations for History of East Central Europe (at the University of Toronto). These are official and confidential university evaluations of Teaching Assistants. Mike’s a great TA…he makes the tutorials like conversations…his handouts are helpful, especially the maps… he’s always on top of when things are due, and making sure everyone has all the handouts… I find his tutorials a very valuable asset when it comes to fully understanding the important themes covered in the lectures. It must have been difficult to stir up discussion about readings which were often long, boring and dry, but Michal successfully did so. One of the best TA’s I’ve had! The only complaint that I have is Mike’s extensive use of “aa” and “ummm” when talking. That really can get annoying at times and distract me from the tutorial discussion. Other than that, Mike is one of my best and most interesting TAs. Very encouraging and helpful. The tutorial was DEFINITELY an enlightening addition to the course. Thanks Mike! Very comfortable and friendly TA. Actually made me feel want to engage more in the class and I felt had if I did not attend. I my experience of tutorials I have discovered that the discussions and the experience of the tutorial is highly dependent upon the TA. Michal is an amazing TA and he is an amazing teacher. He helps our tutorial with questions that we have. It ahs been a pleasure to have him as a TA. You’ve been great, thanks! Only gave us the essays back after the Christmas break. But other then that, great TA. Extremely knowledgeable and friendly. Mike is an awesome TA who always has the class talking. His tutorial questions, which he sends through email, are a great way of guiding the class discussions. In addition they also provide a guide for what we should learn from the readings. He is also understanding of student life and when our essays are due he makes the tutorials easy going and fun (by bringing in historical documentaries, which can be pretty funny at times). Overall I would gladly have him as my TA again next year for another history course, or any course for that matter. Mike was a great help to me. It’s hard to rate him on his tutorials – he tried his best to turn good tutorials, but I think there were a lot of students who just weren’t doing the readings because the discussion tended to lad and wander a lot. I would have liked Mike to be a little clearer summing up key learning from the lecture or tutorial discussion. In the interests of agreeing with most comments, Mike errs on the side of being fair rather than clear (ie – there is no wrong perspective wasn’t really true since so many were clued out). Mike asked the questions that were good ones, then didn’t really give a perspective on what the answers might be. That would have helped. However, when it came to one-on-one help he was fantastic, providing supportive guidance, helping me find my own way with papers rather than telling me what to do. He was also very helpful providing key sources and places look for info. He also ran a library session, which I had to miss, but I thought that was above and beyond the normal – especially for a bunch of lazy students who didn’t do their work!! Mike is a very patient man !!!! Michal Kasprzak is a great TA. He is very knowledgeable and helpful. He ensures that we learn as much as possible and this enables us to do the best we can in this course. Thank you! Mike is overall an outstanding TA. Your statement of teaching philosophy is a short, one- to two-page document that should function both as a stand- alone essay that describes your personal approach to teaching, and as a central component of the teaching dossier. Your statement should not simply describe your experiences and initiatives in teaching, but, as Schönwetter et al. (2002) write, should provide ““a systematic and critical rationale that focuses on the important components defining effective teaching and learning in a particular discipline and/or institutional context” (p. 84). It is personal and reflective, drawing on your own experiences as a teacher. Clarify what you believe good teaching to be. Explain what you hope to achieve in teaching. Contextualize your teaching strategies and other evidence of teaching effectiveness. Promote and provide an opportunity for reflection and professional development in teaching. Provide a means for others to learn from your experiences. Your definition of good teaching, with an explanation of why you have developed or adopted this particular definition. A discussion of your teaching methods: how do you implement your definition of good teaching? A discussion of your evaluation and assessment methods and a description of how they support your definition of good teaching. A description of your students, and their most important learning goals and challenges. A description of your teaching goals: with what content, skills, or values should students leave your classroom? What are your goals for improving your own teaching? As concise as possible: 1-2 pages single spaced (the document may be slightly longer if it includes information on specific teaching strategies). Include generous white spaces between paragraphs to allow for ease of reading and to provide space for comments. Written in a personal, relatively informal tone, usually in the first person. Sometimes mentioning the names of scholars who have been particularly influential to your teaching can be valuable, but the statement should generally not include a substantial review of relevant research. Identify one or two of your most effective teaching methods. Why are these methods effective? Jot down what you know about your students and how they learn. Review some of your teaching materials (assignments, syllabi). What are their strengths? How would you improve them? Consider some of the issues that most shape your teaching: What do you hope will be the result of your teaching? What disciplinary or institutional structures affect the way you teach? What were some critical moments or experiences for you as a teacher? How do you know that a teaching activity or a course has been successful? Consider how these issues are connected. Do your teaching materials reflect your understanding of your students and their needs? Do you derive your teaching goals from a positive or negative experience with particular teaching activities? Using these notes and reflections, write a draft of your philosophy statement in narrative form. What evidence do you have of your teaching effectiveness (teaching materials, feedback from students and colleagues)? Does this evidence reflect what you have identified as your strengths and priorities as an instructor? Re-write the philosophy statement, taking into account your evidence of teaching effectiveness. Have someone else read the statement. Re-write the philosophy statement a second time, incorporating feedback from others. Too general: A statement that does not reflect the particular beliefs, experiences, and circumstance of the author. these techniques or experiences have contributed to the author’s beliefs about what constitutes effective teaching. A statement that dwells too much on negative experiences or circumstances. Too clichéd: A statement that expresses a belief in a popular contemporary approach to teaching without establishing how that approach has been integrated into the author’s teaching. Too oblique: A statement that references a philosophy or belief but never describes it outright. Too few examples: A statement that does not include information about how the author knows his or her teaching to be effective. Goodyear, G.E. & Allchin, D. (1998). Statements of teaching philosophy. In M. Kaplan (ed. ), To improve the academy, 17, 103-122. Schönwetter, D., Sokal, L., Friesen, M. & Taylor, L. (2002). Teaching philosophies reconsidered: A conceptual model for the development and evaluation of teaching philosophy statements. International Journal for Academic Development,7(1), 83-97. The following list of questions, to be used to guide one’s self-assessment of In-class teaching, stems from a workshop on reflective practice delivered by Dr. Nicola Simmons, University of Waterloo in 2007 for the TATP. Dr. Simmons’ questions were in turn adapted from the Teaching Behaviours Inventory1 developed by Prof. Harry Murray at the University of Western Ontario. Arrive in advance to get set up? Greet people as they enter? Introduce self and class session? Make the objectives and outline clear to the students? Set ground rules for class? Include an “opener” towards the beginning of class? Begin at students’ level of understanding? Include teaching strategies to reach all learner styles? Use audio-visual materials to support the main teaching points? Seem at ease with the presentation? Use effective handouts, support student note-taking? Have a contingency plan to meet different levels of student understanding or in case a.v. not working? Maintain energy levels by using a variety of strategies, incorporating breaks? Set challenging yet achievable objectives? Set a pace appropriate for the students? Include neither too much nor too little material? Explain new concepts and terms? Relate material to existing understanding? Remain flexible, but stay on track? Show relationship of material to job market, student interest, etc. Monitor and communicate time limits for in-class work effectively? Create a natural connection from one activity to the next? Allow reasonable time to complete any activities? Ask questions in a way that encourages participation? Use questions to check student level of understanding? Use a variety of questioning techniques? Re-phrase questions when necessary to demonstrate understanding and/or to clarify for other students? Politely set aside questions that deviate from content? Allow enough time for students to respond? Use a variety of techniques to engage students? Circulate to facilitate small group process or to connect with individual students? Use icebreakers and other activities to draw students into the content? Call on students equally, using their name as possible? Encourage differences in points of view? Give feedback and encouragement to everyone? Avoid exclusionary language or examples? Deal effectively with potentially disruptive behaviour? Review the material to assess understanding? Summarize material and tie forward to next class? Invite student comments and evaluation of the class? Bring effective closure to the class session? Use an effective closing activity/metaphor/cartoon to finish? Does my overall approach to teaching incorporate several strategies? Do I provide individual feedback to each student? Is my feedback constructive? Do I organize my feedback in chunks, limited to what the student can reasonably correct? What professional development can I identify that would help me teach better? Do I sign up for workshops, courses, mini-conferences to help me with my professional development? Do I ask for formative feedback from students? Do I make revisions to the next class in an attempt to address the feedback? Do I take advantage of opportunities to watch peers teach? Can I describe the ways in which my teaching has changed as a result of observing/working with others?